RW entered the second of the Offshore Iceberg races last Saturday with Ruth on the helm and Kev in the pit. The forecast looked favourable with a WNW 10-15 inshore and 15-20 offshore breeze. What we experienced was 5-10 W inshore and 10-25 SW offshore! 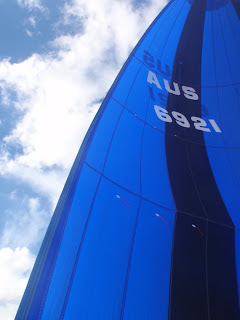 We started near the back of the fleet for the spinnaker start as we stepped through the first hoist of the new Asymmetric Power Cruiser (APC) Spinnaker fitted with ATN Sock and flying off the spinnaker pole. By the time I finished setting up we had slipped back, but we still managed to keep our nose abreast with Escapade (Nolex 30) and ahead of Goodlife2 (Beneteau 39). The APC looked flash with her black on blue stripes and was certainly easy on the eye compared to the brighter colours. The run down the bay saw Ruth concentrating hard to maintain course in the deep running conditions as skip bounced around the deck like a 10 year old on raspberry cordial......ok I like to think I moved that quick! The APC is a 1.5oz cloth and in the light air tended to collapse. As we made our way down toward the heads we gybed toward Nelson Bay. Goodlife2 slipped by and we dropped in directly behind her. Using our APC to block the breeze in Goodlife2 's spinnaker it quickly collapsed and we sailed on by....great slam dunk by the rookie helm! After checking in with Port Stephens Marine Rescue, we cleared the heads and came up onto the breeze holding around 130 deg, hitting right on our VPP target speed of 7.2 knots. Another gybe and we started our reach north in beautiful conditions, all the while I was experimenting with different pole heights, positions and tack lengths for the new APC. Gybing with the sock is safer as there is little chance of snagging or ripping, however is a tad slower until I get the technique down pat. As Ruth headed RW further onto the wind we found she could hold the APC to 50 deg with tack down to the deck. Now came the task of dousing whilst on the wind. We flew the #2 but it didn't provide any blanketing effect really, so I hauled down the sock on the outside of the #2, Ruth quickly belayed the halyard and I stowed the APC below via the main hatch. The better scenario will be to drop it straight down the forward hatch. All the while the breeze intensified quickly rising to 20 knots then 25 knots. 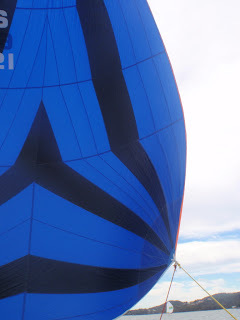 We started to luff up and I quickly whipped in the mainsail #1 reef. As I tensioned the main halyard the gooseneck reefing hook bolt pulled out leaving only 20mm of bolt holding the boom to the gooseneck! We quickly dropped the main and boom to the deck and secured the gooseneck bolt before we damaged the sail or boom or ourselves. The breeze had increased rapidly as the front moved through gusting 25 knots, so it was motor on, headsail out and beer in hand as Ruth headed RW back home. Unfortunately this was to be our first (hopefully last) DNF. As they say, swings and roundabouts.....today it was RW's turn. Besides the breakage, it was a great day on the water and Ruth did an excellent job helming from levaing the mooring, racing all day and back onto the mooring. All the time maintaining her concentration despite never having sailed offshore in her life! So repairs are underway with a new bolt to be welded to the reefing horns and then RW is back for more next week.........and I think I will get the new Symmetrical out of the bag.